Most women will experience dizziness at some point during their lives, and there could be a number of reasons for this. Dizziness can occur when you are tired, over-heated, dehydrated, or haven't eaten enough, among other factors. If you repeatedly face this condition, it is important that you talk to your doctor in order to get to the root of the problem. 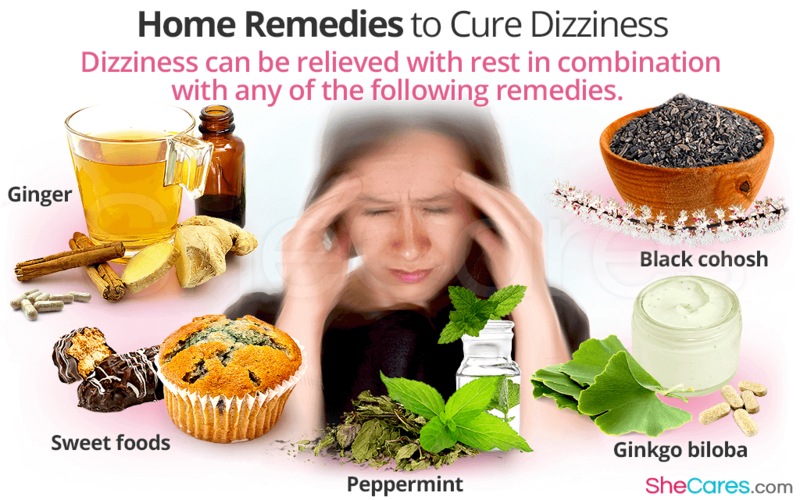 If it is merely a sporadic event, there are several natural remedies for dizziness. Ginger root is a tasty herb with many benefits, among which include its ability to alleviate feelings of dizziness. Herbalists often prescribe it for nausea and light-headedness, and a recent study has revealed that it significantly reduced the sensation of vertigo which had been induced in volunteers. Ginger can be taken in the form of tablets, tea, tincture, or fresh. The preferred method for dizziness is often tea, because sweetener such as honey can be added, which can also ease dizziness. Particularly in sufferers of diabetes, dizziness can be caused by low blood sugar levels, also known as hypoglycemia. To remedy this, consuming sweet food or drink such as chocolate or fruit juice should provide adequate sugars to balance your system and therefore relieve a sensation of dizziness. Many women find peppermint to be an effective treatment for dizziness. Popular forms are peppermint tea or essential oil. If you believe your dizzy feeling is a result of a headache or migraine, rubbing a few drops of this oil on your temples and forehead can bring relief. Also, peppermint has a cooling effect, and so its use is also suggested if you feel dizzy from being overheated. Applying oil to the back of the neck can be particularly cooling. This medicinal herb is one of the lesser known remedies to cure dizziness; however it is available in some natural health shops in various forms. Ginkgo biloba ointment is sometimes suggested for topical application, especially to the temples and forehead, as it can stimulate circulation. Encouraging blood flow to the head can also cure dizziness caused by vertigo. Also available in many forms, black cohosh can be helpful for treating dizziness that is caused by a fall in blood pressure. Many women - especially when they get older - experience a dizzy feeling when they sit or stand up too quickly. This sensation is known as postural hypotension, and is caused by a sudden dip in blood pressure. This herb is thought to be able to be effective in encouraging normal blood pressure. Often dizziness is caused by dehydration, or not consuming enough food. The body requires energy from food in order to function effectively, and when it does not received an adequate amount, you may feel dizzy and weak. Similarly, if you do not drink enough fluids this will lead to dehydration. Many women find that if they have a glass of water and a snack, or larger meal, their dizziness passes relatively quickly. Most often, dizziness is a temporary occurrence which does not take long to pass. To help cure this sensation, in addition to the above remedies, it is usually advisable to sit or lay down for a short period of time. A healthy diet and sufficient rest will go a long way in decreasing the chances of experiencing feeling dizzy.